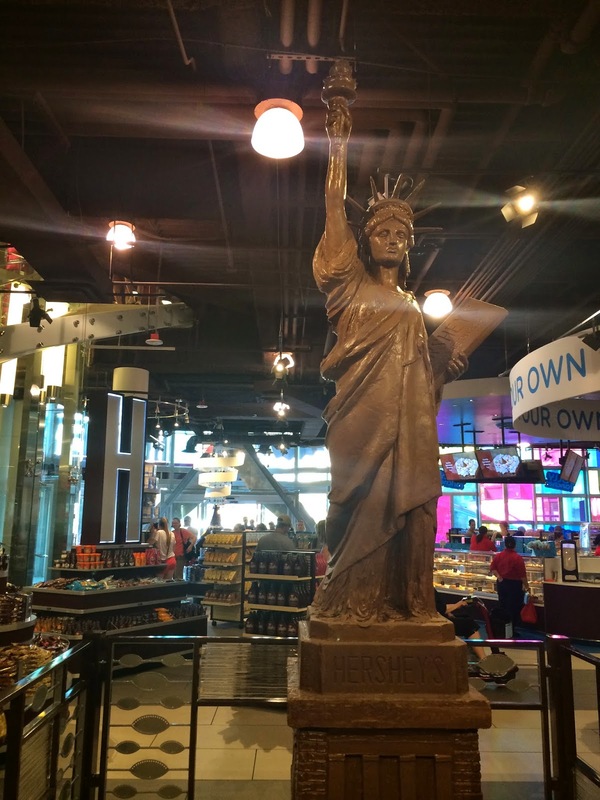 LAS VEGAS DAZE: Summer of Vegas Birthday's Trip Report! 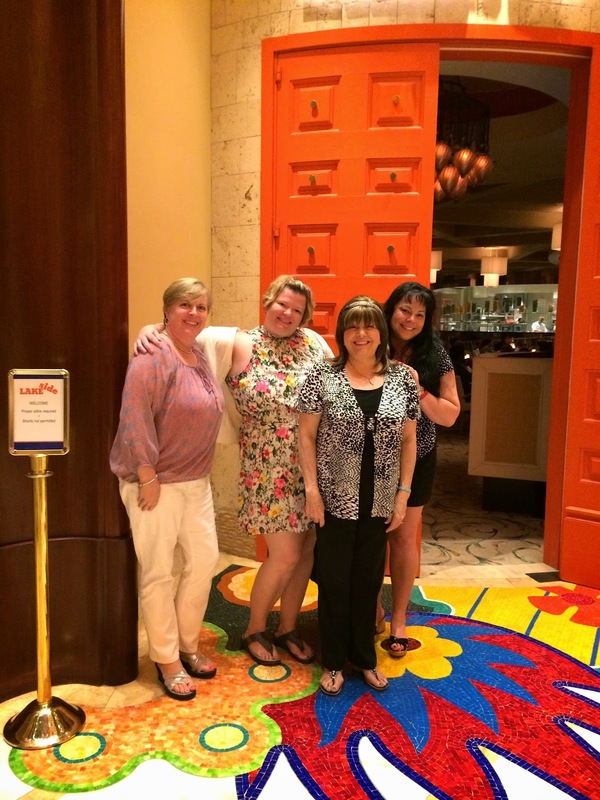 This is part one of the Summer Of Birthdays in Vegas trip reports. During June we celebrated Liz's birthday there, in July I had my birthday in Vegas (yes I know this June trip report is really really late!) and during my next trip the end of August we will be celebrating Gwen's birthday, so this is part one of a summer trilogy of birthday trip reports, LOL! My June trip started out stressful because my afternoon flight to Las Vegas ended up being delayed for over two hours. Normally this wouldn't be a problem since I'm lucky enough to visit Vegas frequently but my friend Liz's birthday dinner was tonight at 6:30pm and it was beginning to look like I would be late for it. Fortunately it worked out despite the delay and I arrived at 5:30pm and was picked up by my Palazzo limo driver Christina. Christina tunneled me and I was glad of it as I needed to get to Palazzo as quickly as possible. As usual once there VIP registration had my room ready and I guess it's a clue I'm there a lot since none of the clerks ask me for my ID when checking in, just my credit card as they all recognize me. Once in my room on the 43rd floor with a great view of the High Roller Wheel, I changed clothes quickly and left the unpacking for later. I was off to Wynn at almost a run as we were having dinner at Lakeside. I hate being late to anything even on vacation so I was happy when I made it on time for dinner. We were a small group for Liz's birthday dinner, Liz, her husband John, Teresa, Gwen, Terri and myself! We had a lovely table inside with a view of Wynn's Lake of Dreams, but since it was early and still daylight we never saw any of the shows. 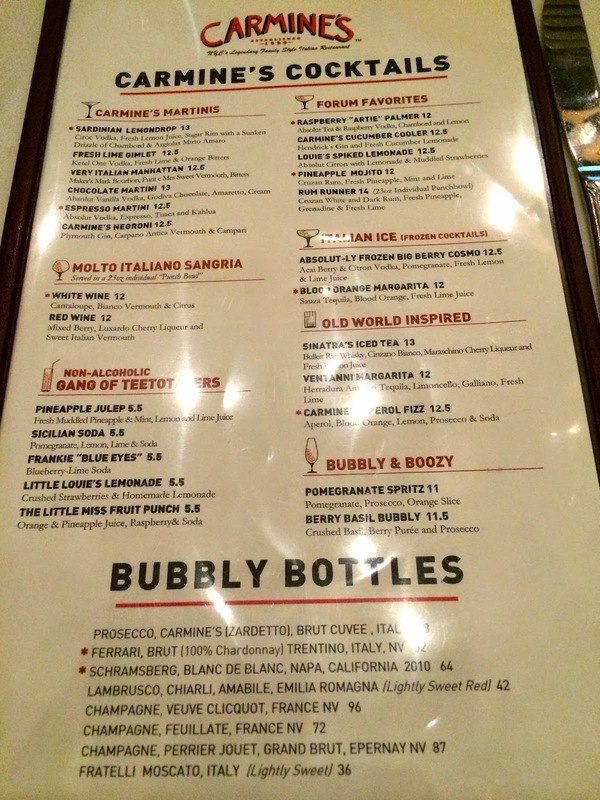 Menu photos above in case the online menus aren't accurate. I snuck away from our table briefly to take a photo of the dessert cart. 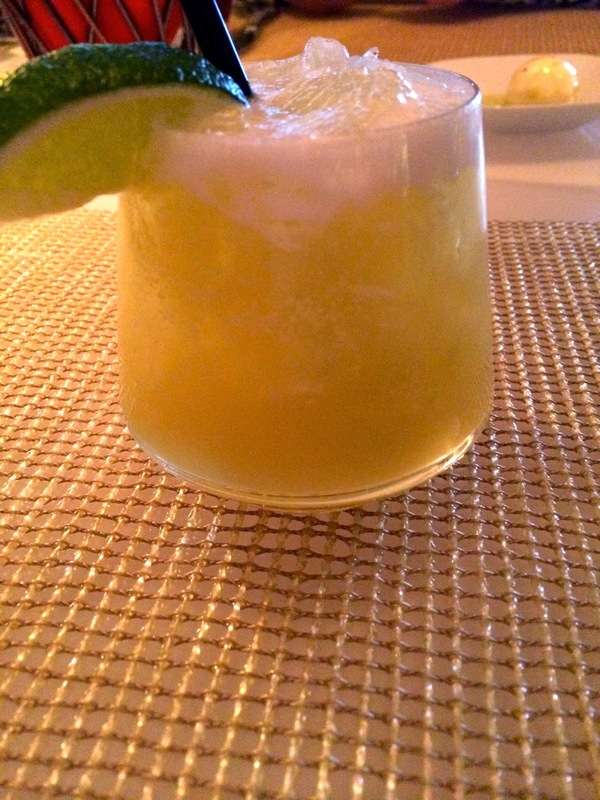 I had a great drink with dinner, Sweet Heat, Don Julio Bianco Tequila, Belle Poire Liqueur, jalapeño agave nectar, pineapple puree, and lime juice! Our birthday girl Liz with her husband! Teresa, Liz, Gwen and me, with Terri taking our photo. 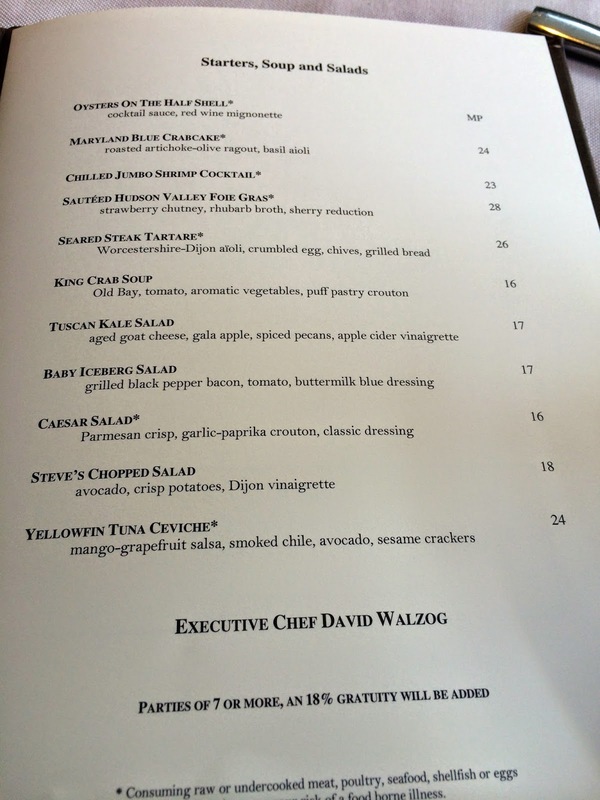 Several of us ordered the Lakeside chopped salad for a starter. The smoked bacon in it was a great addition and the salad overall really good. 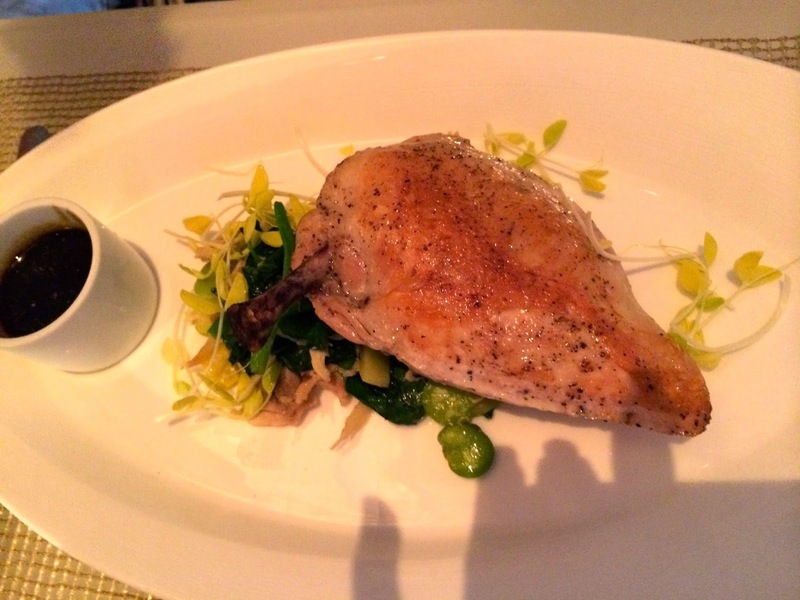 Gwen and Terri ordered the roasted Jidori Chicken which had fava beans, peas and a green curry sauce. One used the curry sauce, the other didn't but I don't recall who did what at this point. I love curry sauce and it really looked good. I remember that both enjoyed it. Teresa had a crab cake appetizer for dinner which looked yummy. Liz ordered her favorite Lakeside entree the scallops with mashed potatoes which is no longer on their menu but they make it for her by request. 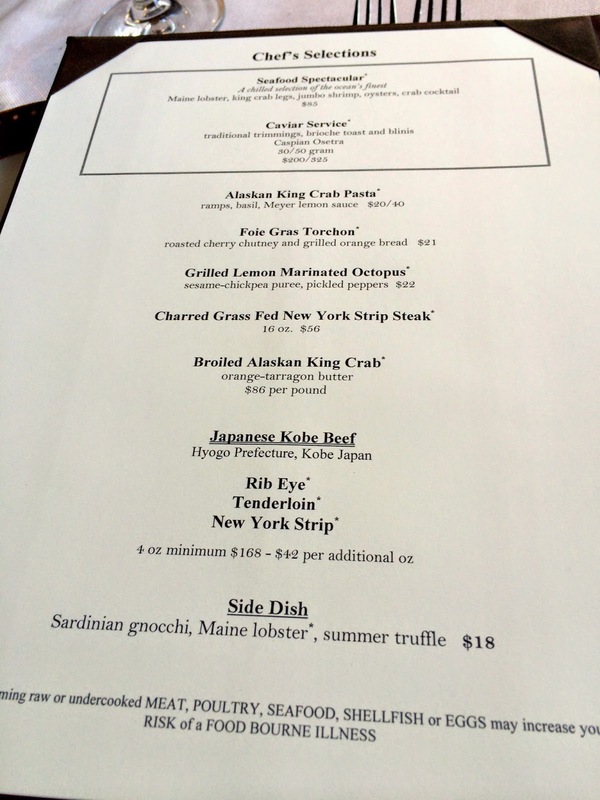 John and I both ordered the Halibut but with different preparations. His Halibut had Japanese veggies and sauce. My Halibut was Mediterrean Style with olives, peppers and artichokes. Unfortunately while the Halibut looked great and was fresh, it had been overcooked for both of us and mine was very dry. 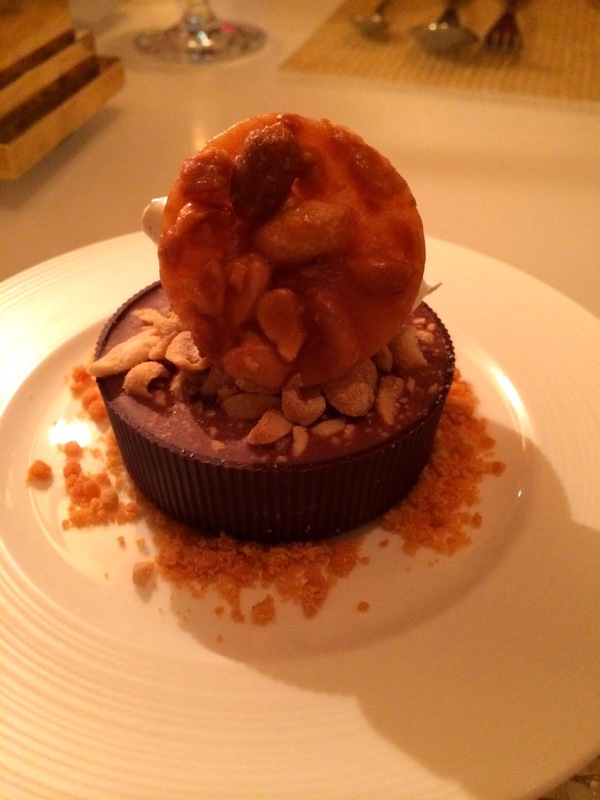 I've eaten at Lakeside quite a few times and this was disappointing and really surprising. 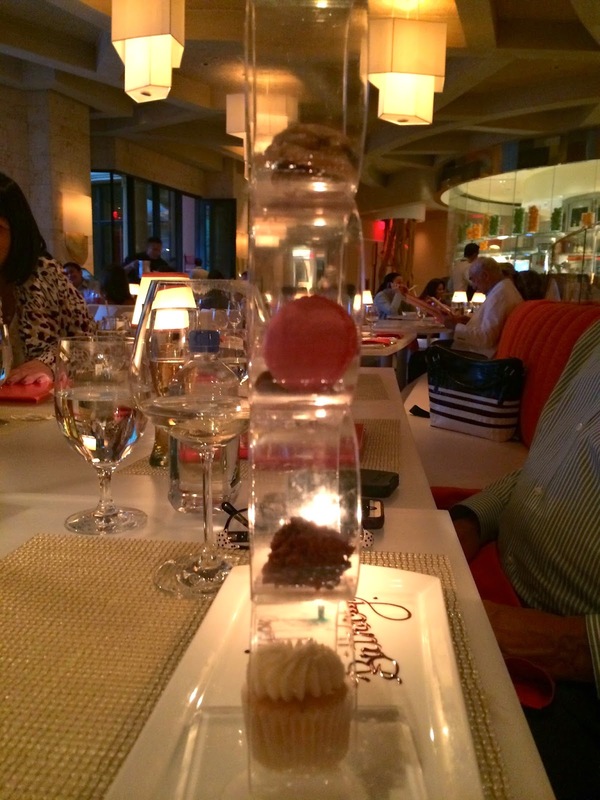 Liz, received a complimentary dessert of mini desserts that had a fabulous presentation. Terri and John are being camera shy, our group after dinner outside of Lakeside. It was time to get my gamble on and the others felt the same so with John being a nice husband and taking Liz's gifts back to their room the rest of us went to Encore to play VP and Slots. A big surprise after leaving OMG! 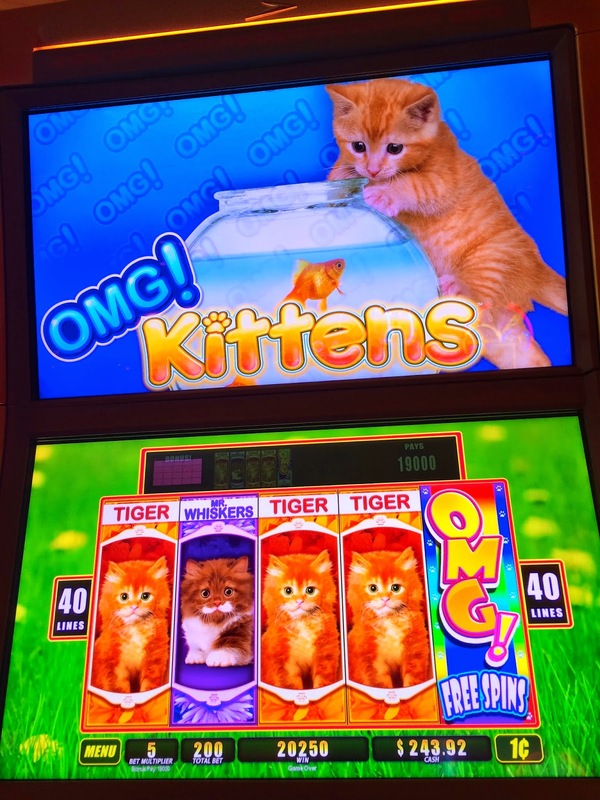 Kittens was getting a bonus right away on the new Mystical Mermaids Slot! I have a video of this one on my youtube channel if you are curious. Gwen this trip was mainly low-rolling on Buffalo and doing quite well with her obsession, I mean strategy! I played it a couple times with her this trip but didn't have her luck on it, but then I wasn't using her strategy which now after hearing it worked successfully for Gwen I might have my Mom try it on my upcoming birthday trip. After a hour or so of fun at Encore's casino I said goodnight to my friends who were all staying at Wynn with the exception of Terri who lives in Vegas and was going home and I returned to Palazzo. 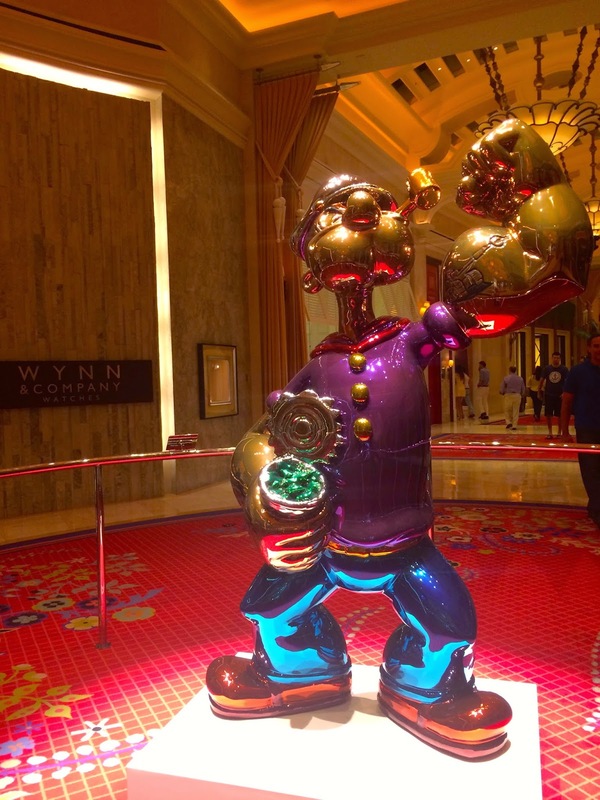 As I was walking back I took a look at Wynn's latest art acquisition a statue of Popeye which had two guards around it every time I would pass it this trip. As a work of art it's interesting, but I'm really not sure it fits in with the Wynn decor. 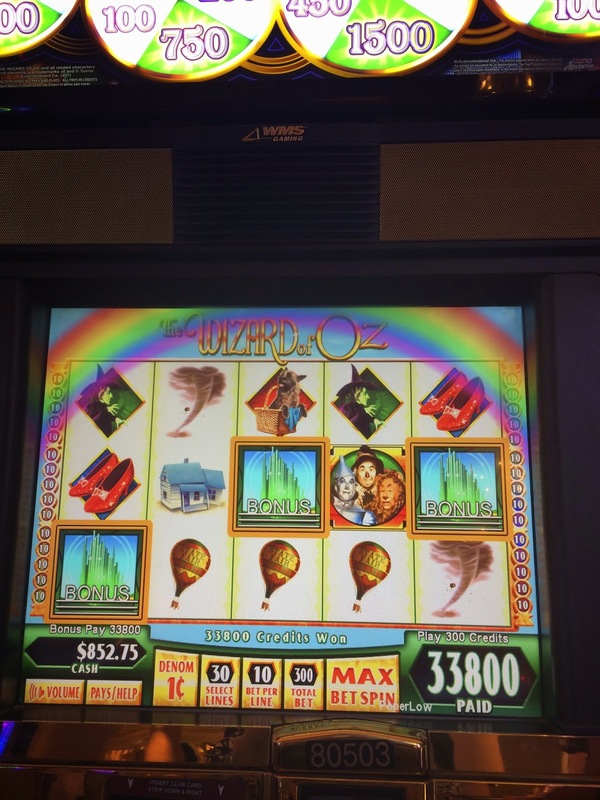 Once at Palazzo I was eager to try my luck on my favorite $1 Quick Hits. I had some hits and a couple bonuses but nothing great. I usually stay away from the newer $1 Davinci Diamonds in the Palazzo HL room because it is a hoover and I'm not alone in thinking that as I've heard other gamblers in there complaining about it. Darn them for taking out my old ancient Davinci Diamonds which could usually be counted on for some wins! 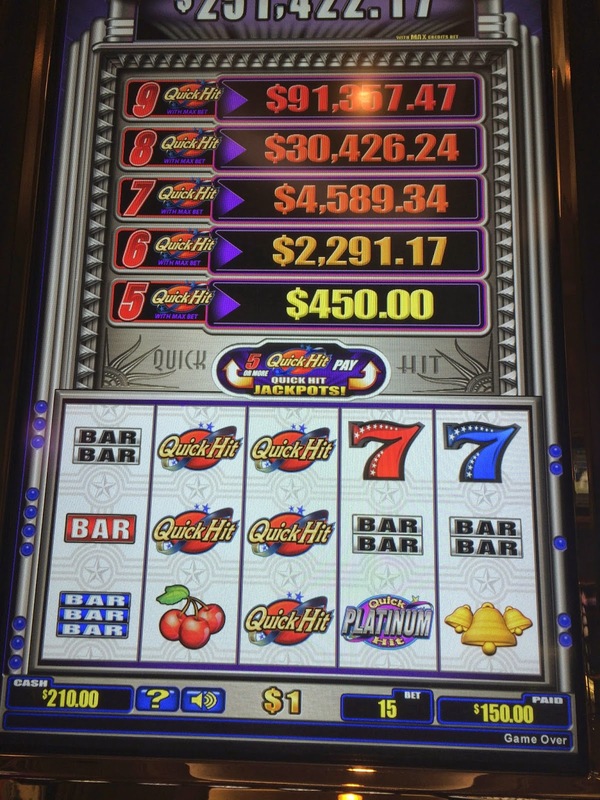 For the first time I briefly had some hits on this new slot, but later in the trip it was to get its revenge and revert to hoover mode. Time to leave the Palazzo HL room but not far outside is my favorite, okay the only $1 Jungle Wild slot that I know of and have won on. Tonight it just gave me a hit and a weak bonus, but I knew I would return to it. I decided to walk over to Venetian where I made a quick stop at the HL room there to see if the Quick Hit slot would cooperate. It made a weak gesture of a win so I left. 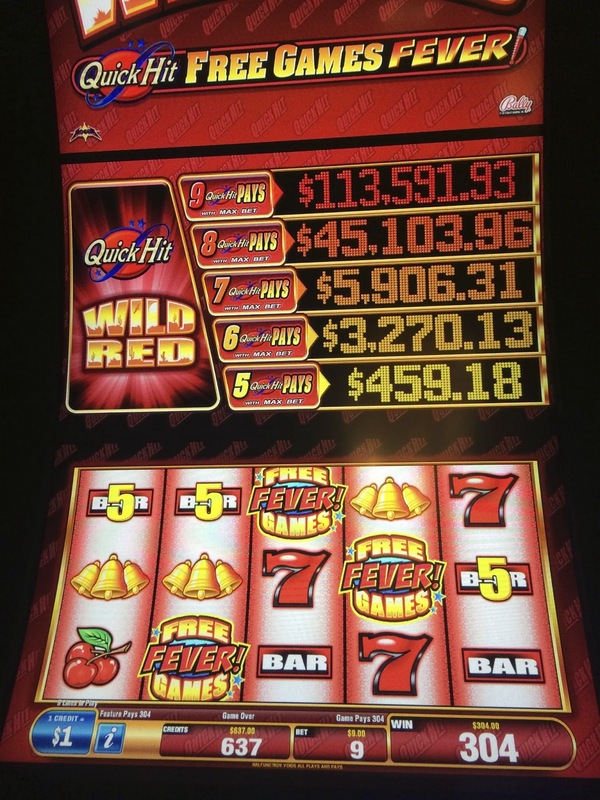 I started to get some wins going when I went to my favorite penny slots like Top Gun. Top Gun gave me a few bonuses but I didn't win much because my picking sucked, then a few fly by bonuses that were just okay until I hit a nice one for $310.80 on a $2 bet! After Top Gun, I went to my favorite Hangover slot which was in bonus mode and let me recycle money for Grazie points for about 30 minutes or so. Normally I don't sit at any one slot for long so 30 or more minutes is a exceptional amount of time for me to continue to play and not leave for the next shiny machine. 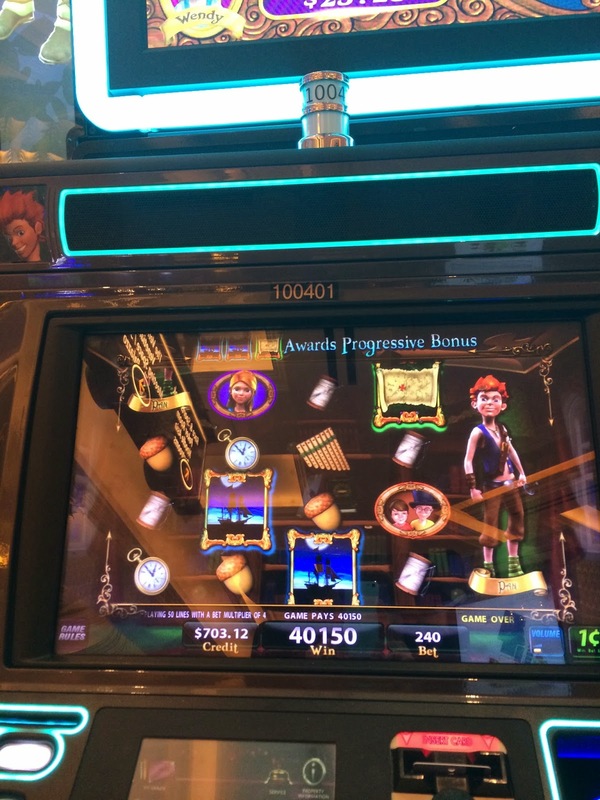 Walking around Venetian after Hangover I saw a new slot called Adventure to Never Isle! After Never Isle I tried a bit of Jurassic Park and had a little action on it. 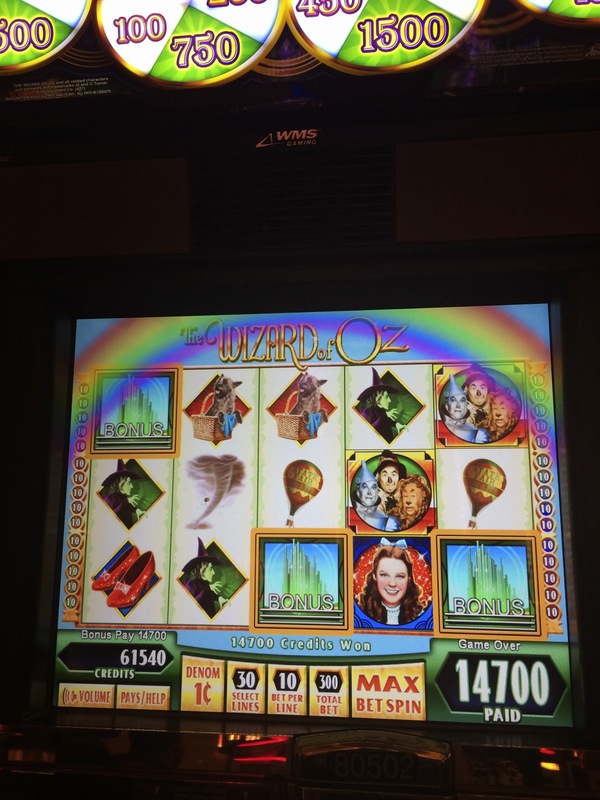 After Jurassic Park, I felt Glinda calling me so I decided to play the original WOZ! Turn out it wasn't Glinda calling me but the flying monkeys who for a change paid me a couple good bonuses! 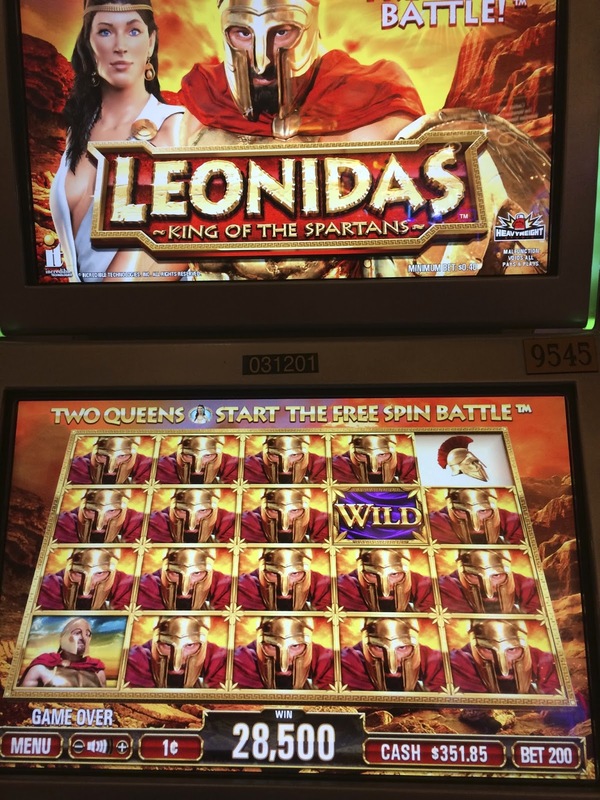 Before I left for Vegas some friends of mine from Slot Fanatics were having a Meet in Reno and I had read how they had some great wins on Leonidas so as I was walking back to Palazzo, I found one at Venetian on my way out and gave it a try. I was happy I did as it gave me a couple bonuses and some good hits. 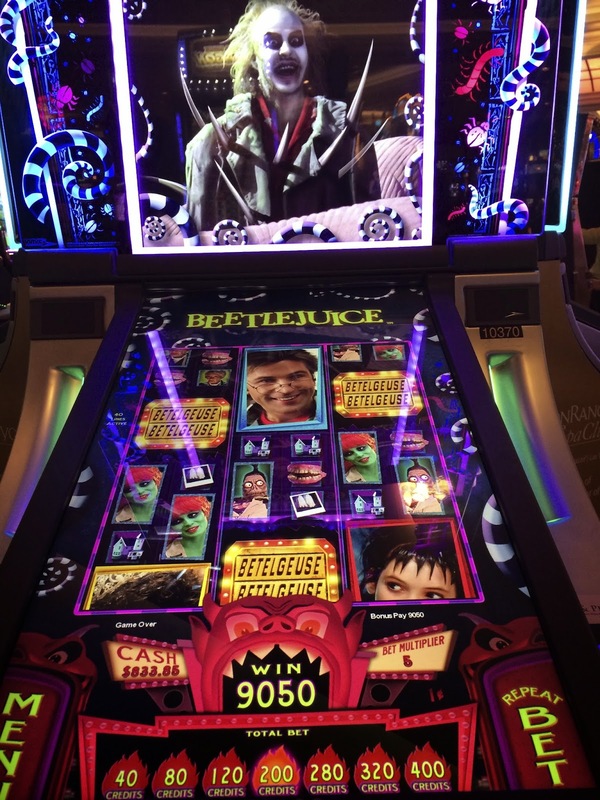 After Leonidas I headed back to my room, but got distracted for a few minutes when I saw the new slot Beetlejuice! Really fun slot if you can find it in bonus mode. While I didn't have any big wins on it, the potential is there for big money! Finally back at my room admiring the view while I unpack! Next morning I slept in late and didn't drag myself out of bed until 11am. Today I was meeting Skyler for lunch at Grand Lux at 1pm and for some slot play afterwards. It's just now that I'm realizing that Skyler and I never took a photo together, darn it! For lunch Skyler ordered the appetizer Double Stuffed Potato Spring Rolls. This appetizer is mashed potatoes, rolled in wrappers topped with melted cheddar, applewood smoked bacon and cream onion! Boring as usual I ordered the Sonoma salad which is grilled chicken, avocado, bacon, corn, sweet dates, raisins, goat cheese and glazed walnuts. I really love this salad! After lunch Skyler and I headed over to Venetian to play slots. 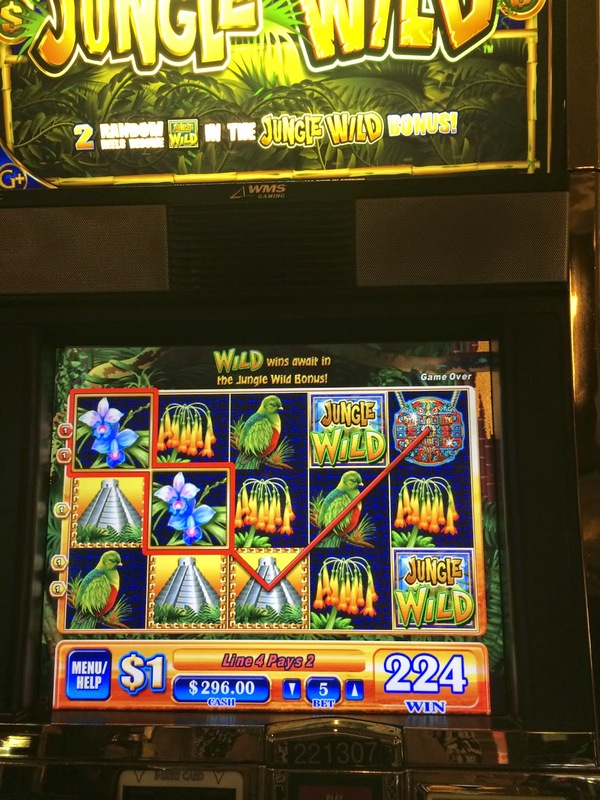 We ended up spending a bit of time on Jurassic Park as it was giving both of us bonuses, most of them low paying but I got lucky with the hit for $219.40 below. Later we walked back to Palazzo where Skyler was going to try her luck at the ZZ Top slots while I played some Beetlejuice and Kiss. Had a great time chatting and playing slots with Skyler and looking forward to seeing her again the end of September when I attend G2E. When Skyler and I were at Venetian we saw a lady order a delicious looking mudslide and we decided we wanted one but alas no servers ever came by to take our order. After Skyler left I finally was asked if I wanted a drink and got this delicious frozen mudslide. 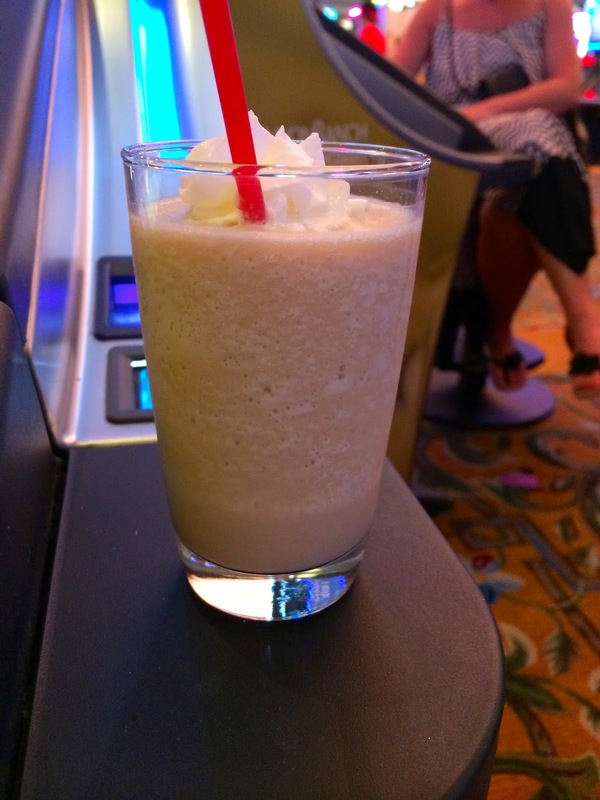 After enjoying my mudslide drink and some more slot play it was time to meet up with friends Gwen and Teresa or dinner. Dinner tonight was at Tao and if you have read many of my past trip reports you know it's a favorite restaurant of mine. We started out with a great assortment of tempura veggies, such as garlic green bans, asparagus, onion rings and avocado. 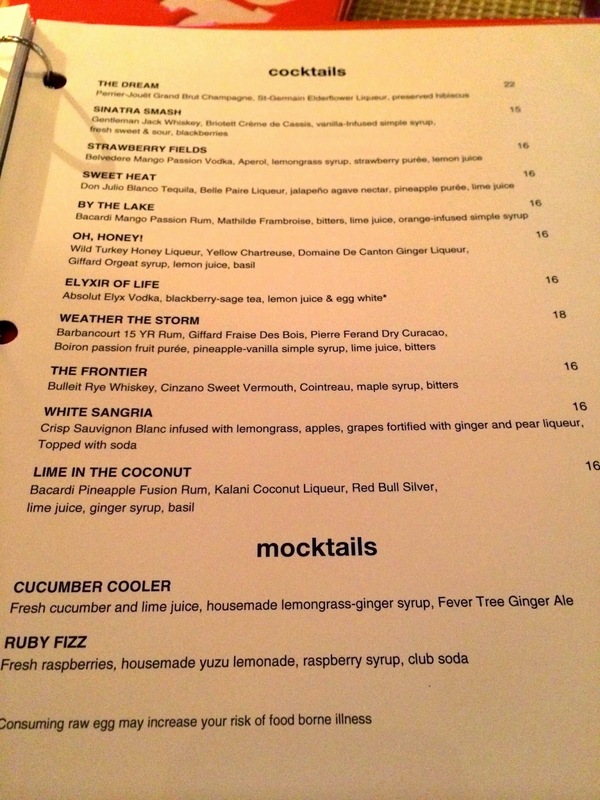 Since they changed the recipe of my favorite drink Phuket over a year ago I have previously asked them to make it according to the previous recipe which the bartenders have tried to do but it just doesn't taste the same because the bar no longer has thai chillies to put in it. 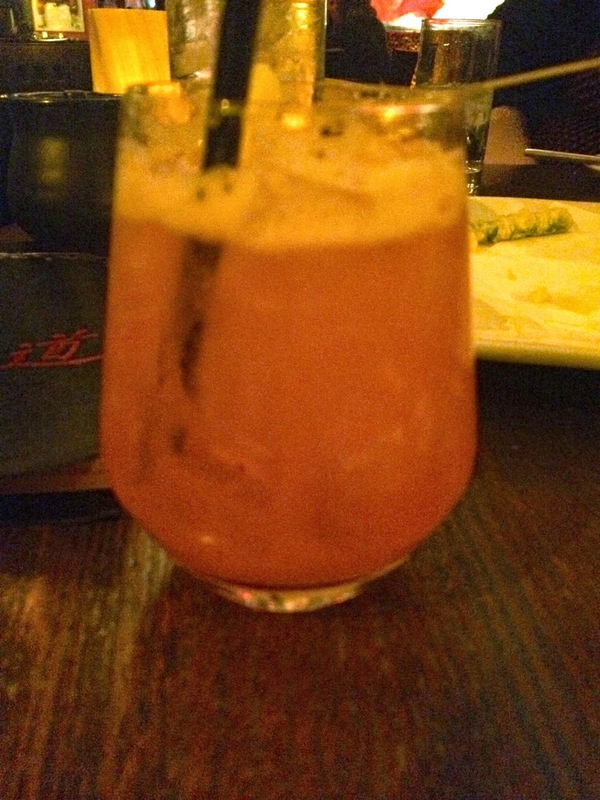 I finally branched out to a new drink, the Dragon Slayer that our server suggested and it was great. There's been some menu changes at Tao and Gwen was at first sad that her favorite Shrimp XO dish was no longer on the menu. She went for the shrimp dish that replaced it and absolutely loved it even more then her previous favorite! I forget the name of this new entree but it's the only shrimp entree currently on the new menu. There was a small delay between Gwen's entree being delivered to her and Teresa and I getting ours and our server let us know it was his fault. That drink must have been pretty powerful because I quipped he could turn around and I would spank him! It was around this time the assistant manager came by and introduced himself, gave me his business card and told me to let him know in the future if there was anything he could do for me. Coincidence? LOL! We ordered the Giant Fortune Cookie to share and were surprised when they set down this platter that had the fortune Cookie and several other desserts on it. The assistant manager came by again to see how we liked it and we told him they were all wonderful. Later in my room when I checked my bill I saw the desserts were complimentary from him and the server who had put them on our table had neglected to tell us that, and instead when questioned about the platter inferred they had also changed their dessert menu and this was now the way the Giant Fortune Cookie is served. Well this is not the new way it's served and I'm really sorry we didn't know at the time in order to express our thanks. After Gwen and Teresa headed back to Wynn, I continued to play slots and had a lot of nice wins both at Venetian and Palazzo. 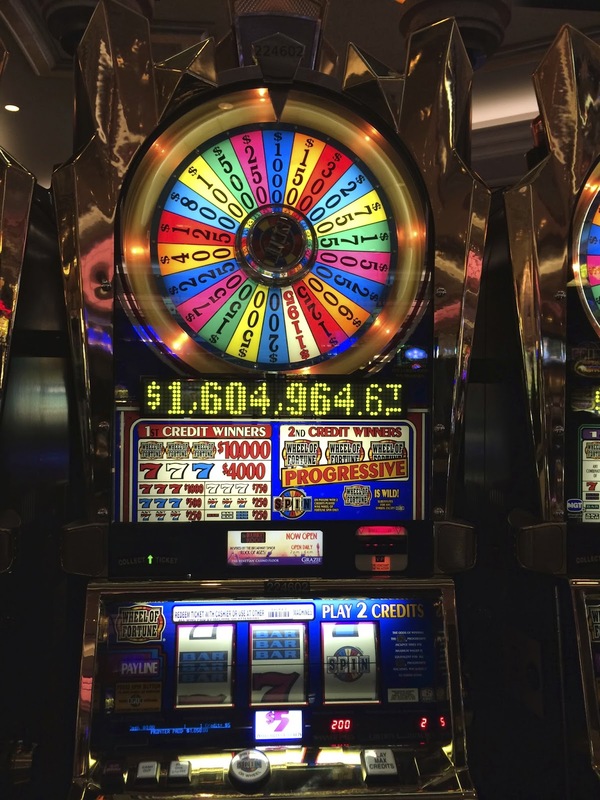 The biggest hit that evening was getting $1000 on the $5 Wheel of Fortune! I like the $1 Diamond Heat U-Spin slots at Palazzo too. 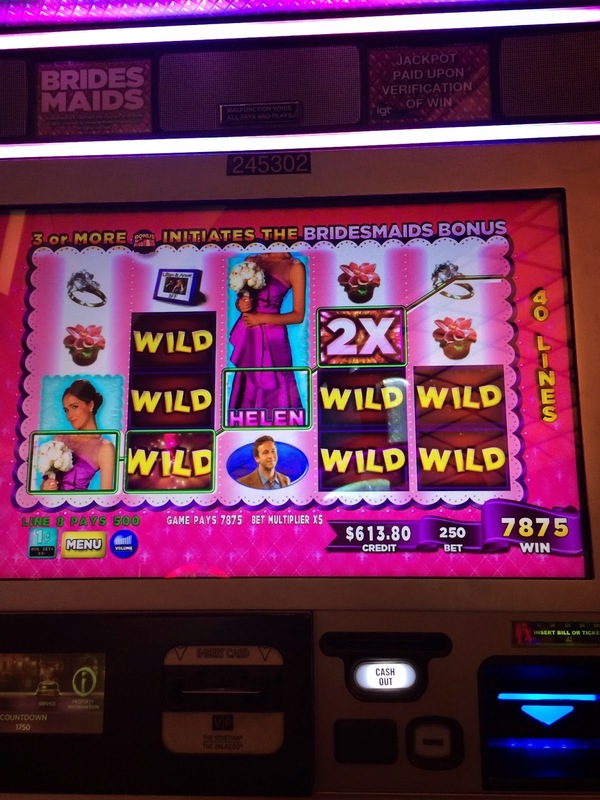 I had been avoiding playing the new slot Bridesmaids but after seeing Teresa earlier in the evening get a bonus on it decided to give it a try as I was walking by it on the way to my room. I was pleasantly surprised to find it in a bonus cycle and I must have had about 20 plus bonuses on it before I retired for the night. While most of them were low wins, I had a couple substantial ones too and walked away several hundred dollars ahead from Bridesmaid. Bridesmaid is a cute slot, a lot of humor. Later in the trip I tried to catch it again in a cycle of bonuses but it didn't happen so I guess what I experienced is definitely not the norm! After my fun bonuses on Bridesmaids it was back to the room and time for some sleep! Next morning I slept in late only getting up in time to shower and dress before it was time to meet up for lunch with Shirley (Pruske) and David at Grand Lux. I met Shirley and David years ago on Trip Advisor and our first meet and greet all those years ago was at Bellagio's Fontana Bar which is now Hyde, that's how long it's been between meeting up again. Shirley and David had sandwiches, while I had my usual Sonoma Chicken Salad. The food as always was good at Grand Lux and the three of us had fun catching up with each other. After lunch it was time to play some slots and earn my points for the day for the Monopoly promotion that Venetian and Palazzo had going for the months of June and July. The promotion has ended now so I won't go into details other then to say I won some free play during it which added up to a couple hundred dollars and a Monopoly game with the theme of the Venetian property. When I won the Monopoly game they were out of it so they said they would mail it out to me. It's now July 31st and I'm still waiting for it so no photo for this trip report. I couldn't pass by Beetlejuice without trying to get a big win, I failed but had fun. The photo above is the new Aristocrat 60's theme Batman and Robin slot. It's a cute slot and the bonuses seem to come frequently but so far all my pay outs have been very low. 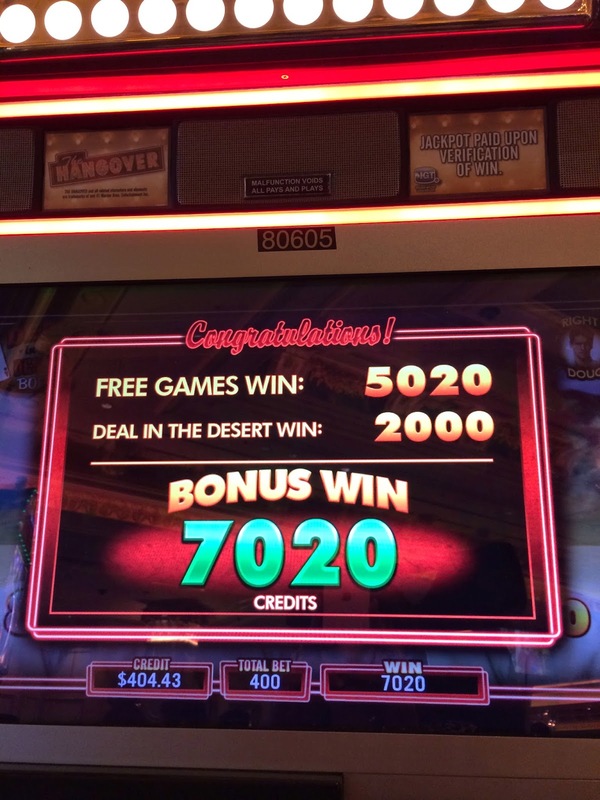 Was happy to get my bonus at Venetian on $5 Pinball but it didn't pay me as much as I hoped. 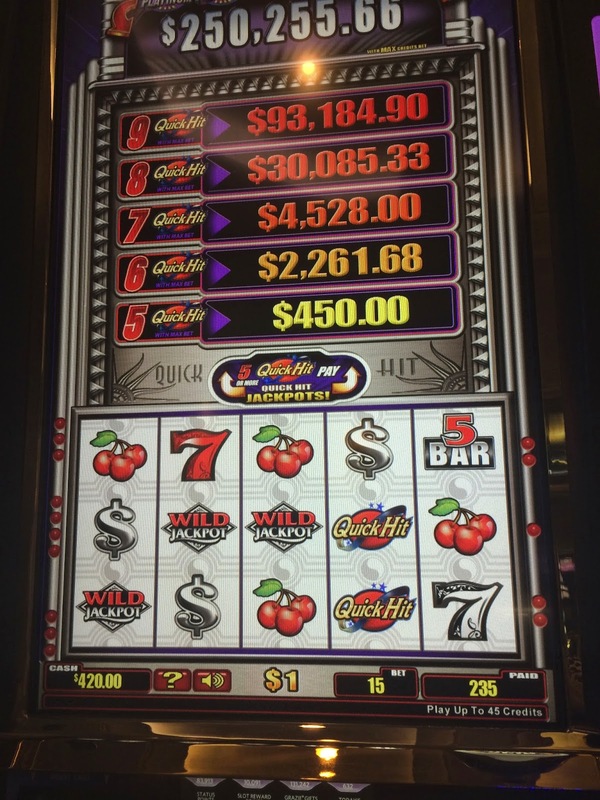 Was really happy to get the six Quick Hits on $1 Quick Hits at Palazzo for $750.00. 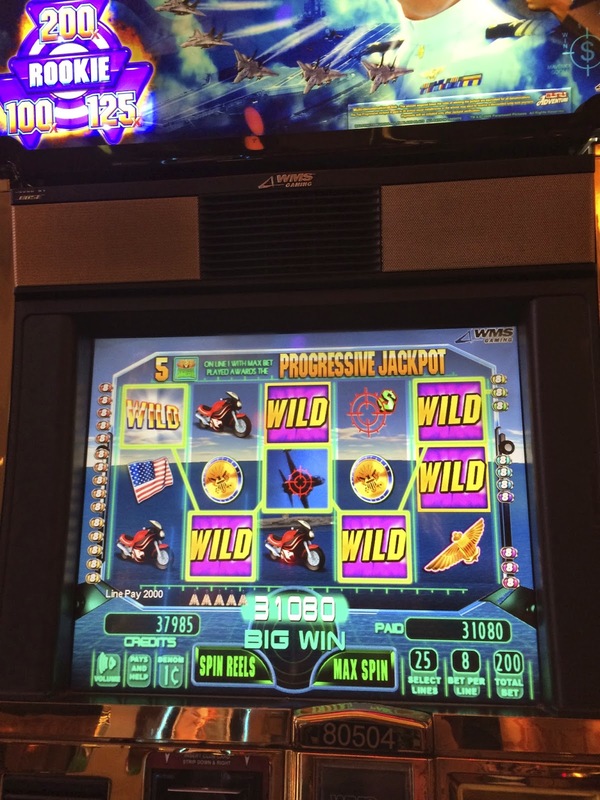 Didn't get the 2k progressive because it takes a max bet which on this machine would be $45.00! Tonight Gwen was treating me and Teresa to dinner at one of my favorite restaurants SW Steakhouse at Wynn! 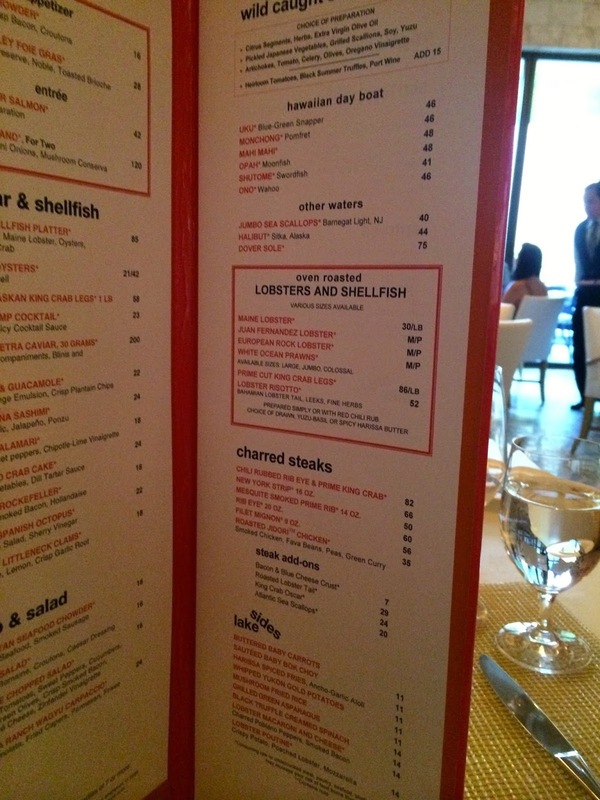 For those who might want to eat there in the future here's photos of their menus. 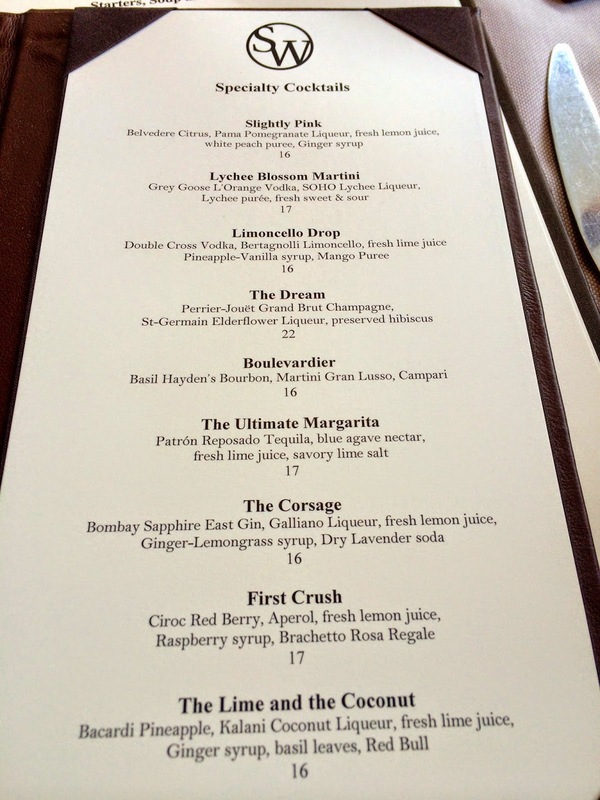 Below is Teresa's cocktail the Lime and the Coconut, drink it all up! Yum! 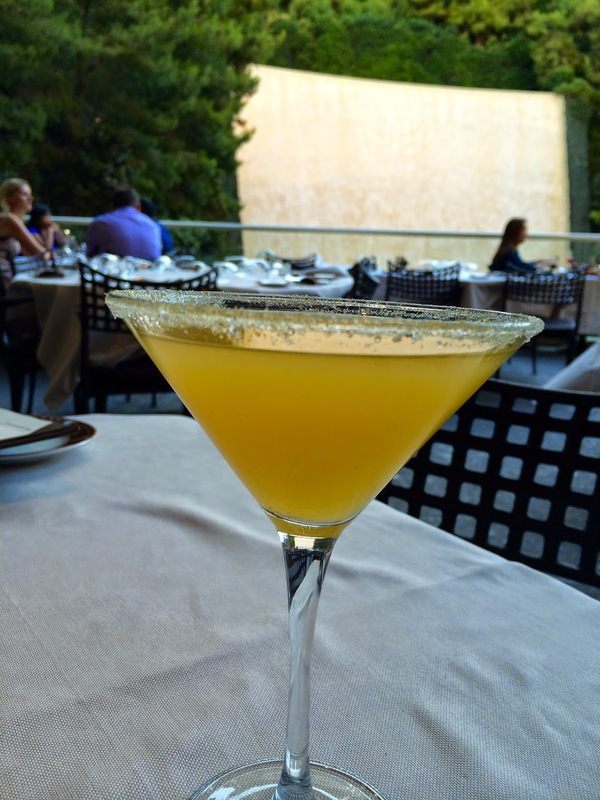 My delicious Limoncello Drop with Mango puree below. I loved our patio table so much I made a reservation that night for my July birthday dinner and requested the same table, 101! You can't tell from the photo but across from Teresa is a wall to give the table a bit of privacy, in back of Gwen is the Lake of Dreams, we had a wonderful view of it, and behind where I was sitting next to the wall was the sliding glass door to the inside of the restaurant that was open so the air-conditioning from there made the patio temperature very comfortable! Bread basket of pretzel rolls, and to the right bacon cheese rolls to die for! My appetizer was shrimp, very nice! Gwen and Teresa had Steve's chopped salad. I had this salad the next month and it's good! Gwen had chicken which I know she enjoyed. When Teresa ordered the side of Brussels Spouts with Andouille Sausage with Mustard Creme I wasn't expecting to like it but I loved it so much I think I'm the one that ate most of it. 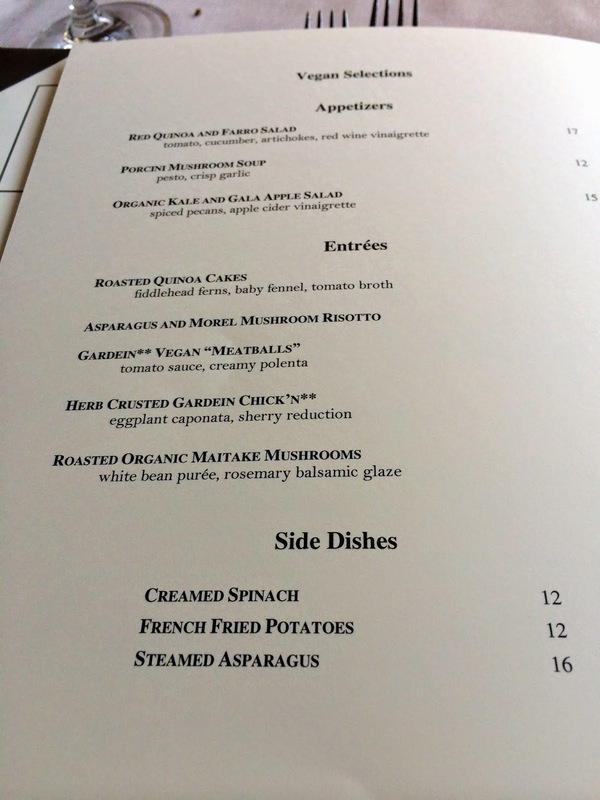 I ordered the Sautéed Summer Vegetables which was also fresh and good. Teresa's steak below which I know was delicious. Normally I don't eat potatoes but I did try the Crisp Potato Rossi with Chive Cream that Gwen ordered and it was excellent! My Halibut was fantastic, cooked to perfection. I was a bit tipsy at this point and kept threatening to march across the walkway to Lakeside with my entree and show them how Halibut should be cooked. Of course Gwen dared me to do it but I guess I hadn't had quite enough to drink as I wimped out. So it's dessert time and we are full, there's food left on the table, but does that stop us from ordering dessert? Of course not, it's dessert!! 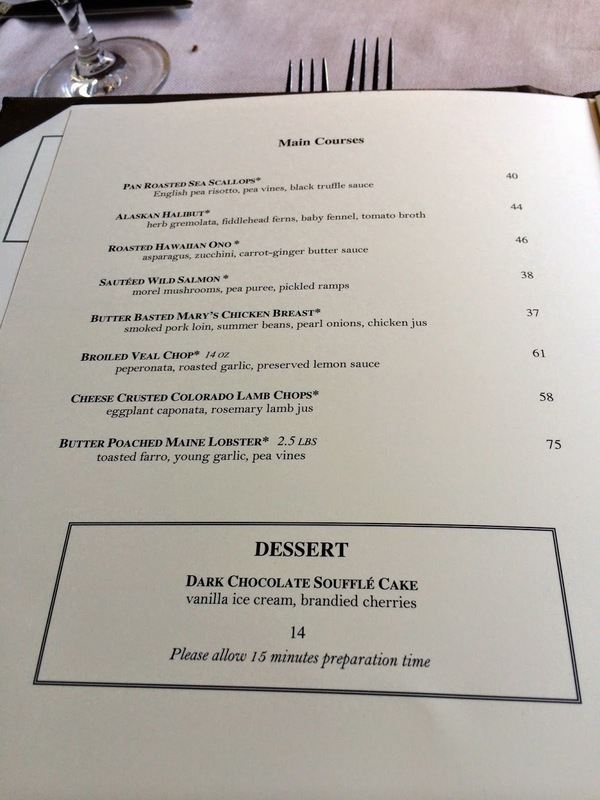 Do we stop at one dessert? No, of course not, LOL! I had a taste of the Tahitian Vanilla Creme Brûlée and it was yummy! The Key Lime Square was light, refreshing and good! 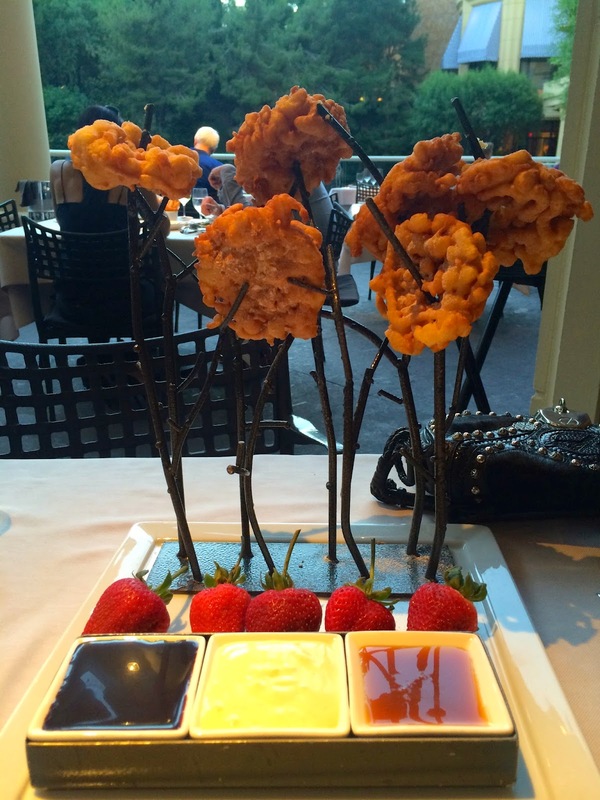 The star of the evening and not to be missed was the order of Funnel Cake and Strawberries with three dipping sauces! During our dinner one of our favorite Lake of Dream shows, the singing Frog! 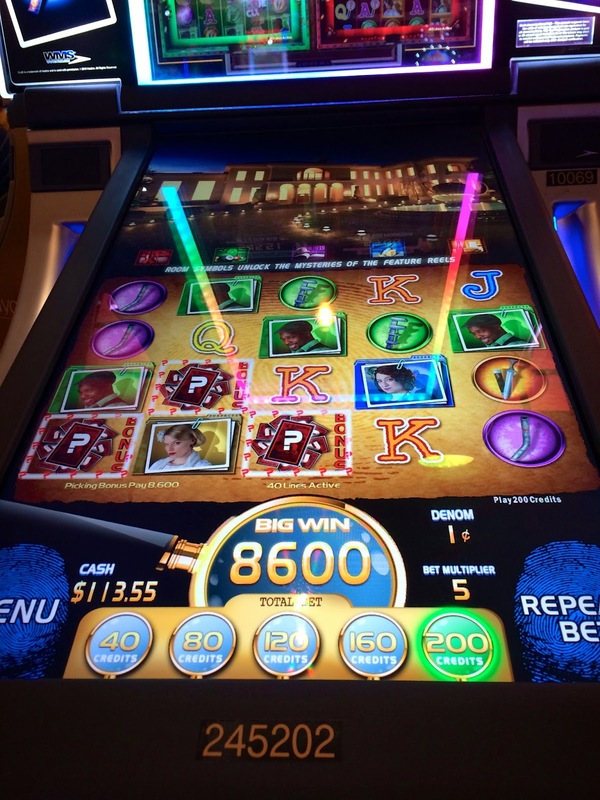 Not too long after dinner it was back to Palazzo for some more slot play. 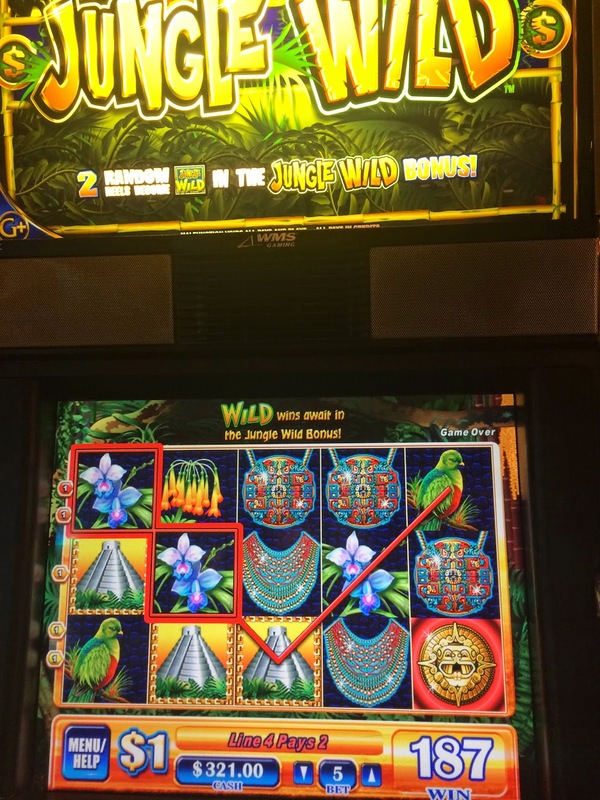 It was a good evening with some very nice hits, including this one on Jungle Wild! Some fun hits on Clue 2 and Monopoly Jackpot Station. The Bourbon Room at Venetian was full of happy people singing along with the entertainment. A farewell session with $1 Quick Hits at Venetian before returning to Palazzo. While walking through the casino to the room elevators I stopped briefly at the new Little Green Men Slot. Not sure if I like this one as the bonus requires shooting at stuff with a plastic gun and I missed a lot. 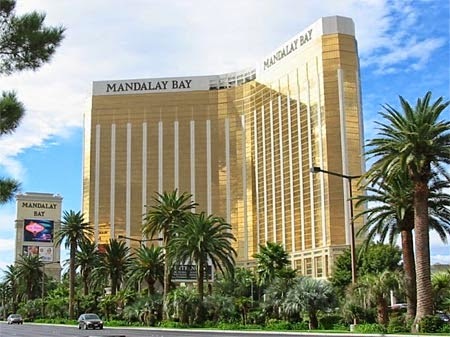 Next morning was my day to switch to my great room suite at Mandalay Bay. I wanted to make sure I liked the suite first so I went over around 11am to check in and was told I had a bit of a wait for it so I used a MyVegas award for the MB buffet. The buffet was fine for free, but wasn't really to my taste so I'm glad I didn't pay for it. After last night's dinner at SW Steakhouse I only ate a little bit from each of these plates and really just to find out if Mandalay Bay's buffet was worth recommending. While I liked the dining room and its view, the quality of the buffet isn't as good as Wynn, Wicked Spoon at Cosmo, Aria or Bellagio which are around the same price point. After I had eaten I got the text with my room number and went to check it out. It was at the end of the hallway and it seemed like it would be a quiet room (which it turned out to be) so I was happy about that. The bathroom in the Great Room suites are very large. More photos of the suite, for anyone who might want to stay there in the future. View from the window in back of the bed. The heavy full length mirror was on the floor. Not sure why they don't just get a lighter mirror and hang it on a wall someplace. There was a tournament going on during my stay at Mandalay Bay, Treasures of the Deep. I had been invited to it but I went in on what I considered a better offer. Also, I prefer tournaments that aren't out in the middle of the casino floor. Photos of the tournament area. After checking out my room I cabbed it back to Palazzo to check out. 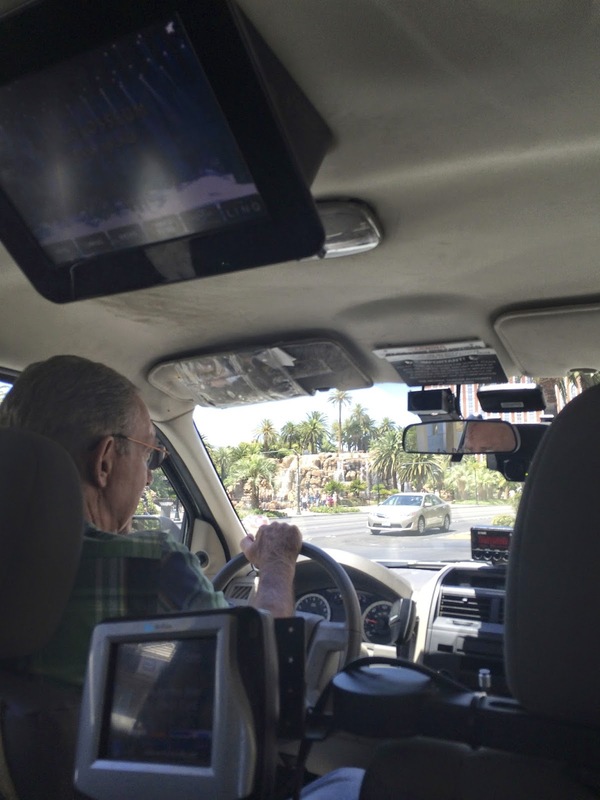 My driver was elderly and managed to drive slowly enough to hit every light on the strip, <sigh>. When I checked out of Palazzo I decided on a whim to use a bellman for my luggage which is unusual for me as most of the time I just take it myself. My decision on this turned out to be a good one when we went downstairs to the taxi line together and there was a long line waiting but no taxis! Being Platinum Grazie level gets me to the front of the taxi line but without a taxi that doesn't do much good. Fortunately it turns out if you use a bellman they are allowed to take you up to the level the taxis drop people off at and put you in one there which is what he did. Once in the taxi I directed the driver to cut across the Mirage parking lot and take Sinatra and Industrial to Mandalay Bay so it didn't take long to arrive and be back in my suite unpacking. After unpacking it was time to see if the slots were going to give me some wins and surprisingly they did. I had a could nice wins on $5 Top Dollar! Not a huge bonus on Cleopatra but got the bonus quickly. Dollar Davinci Diamonds welcomed me back to MB by hitting for $800! Then hit for another $140.00 before I cashed out. 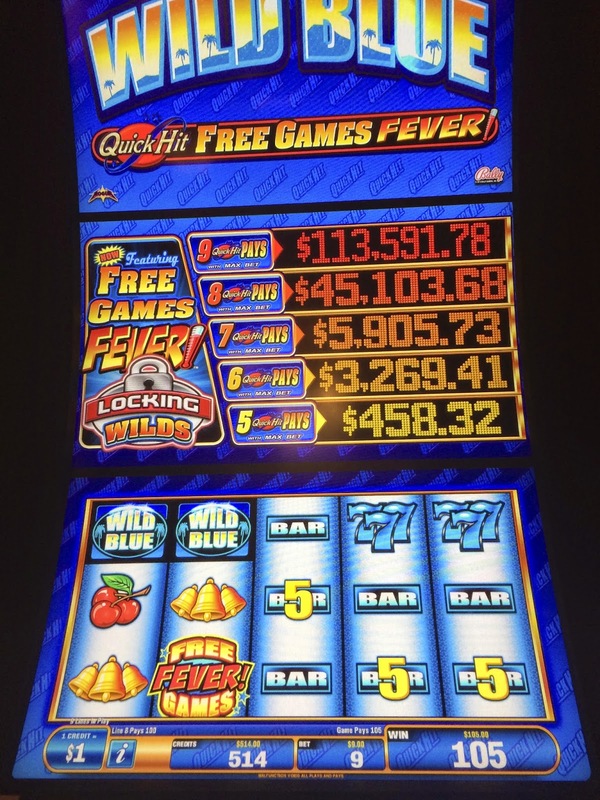 Decided to play $5 Double Gold because I had a feeling and hit for another $800! 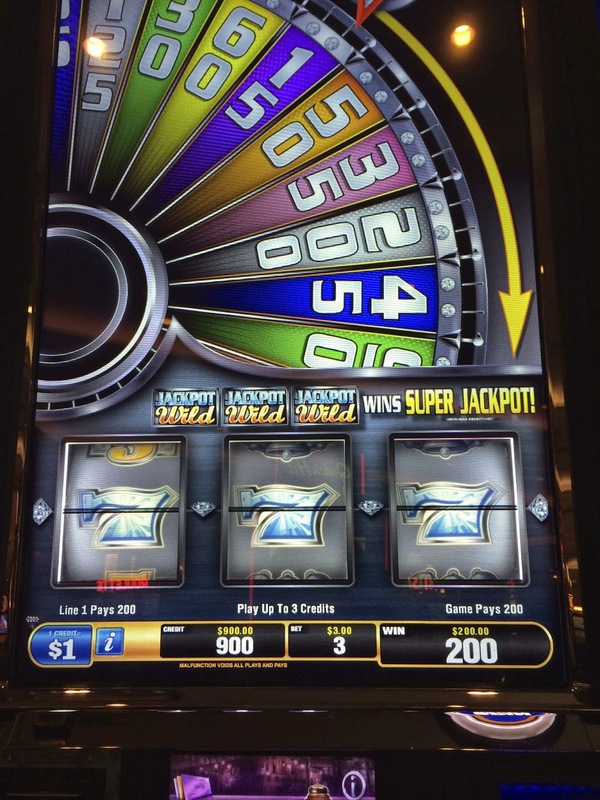 Hit a $5 Wheel of Fortune spin for 100 credits for a $500 win! I got a bit carried away then with the $1 slots but had some brief fun with the Lucky Leprechaun Slot and Texas Tina below. It was then time to leave my winning streak and walk over to Carmine's at Caesar Forum Shops. I took the MB tram to Excalibur, then cut through NYNY to walk outside to Monte Carlo where I took the M-Life monorail to Bellagio. At that point it was time to take a break and play a bit of Clue at Bellagio. I met up with Terri at Bellagio and after my wild win with Clue we walked over to Carmines to meet up not only with Gwen and Teresa but Jen and Brian who had arrived earlier that day. 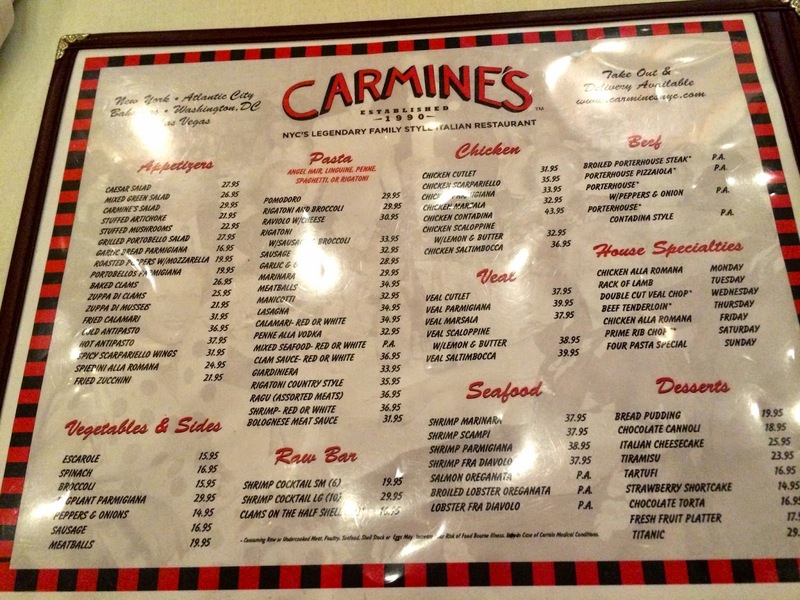 Carmine's is a family style Italian restaurant so everything on the menu is served in large portions meant to be passed around and shared. Our happy group, minus Terri of course who is taking the photo. 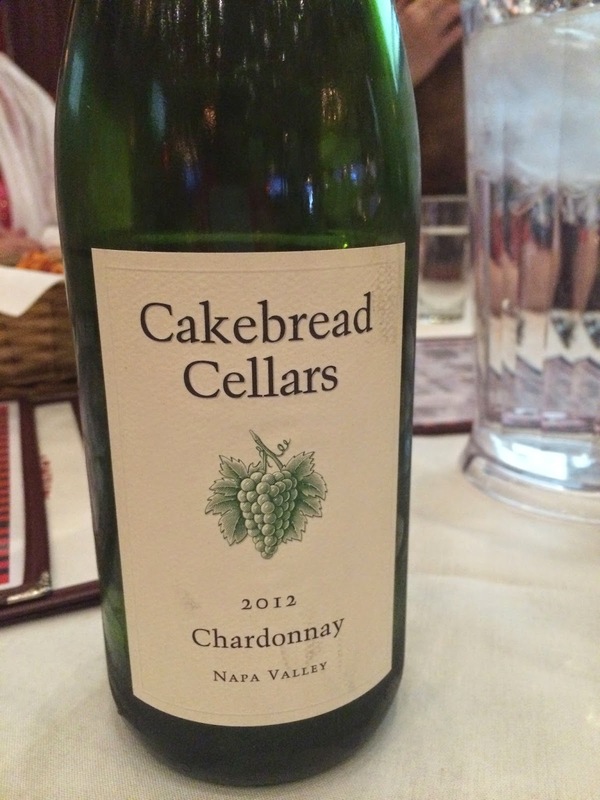 Teresa and I shared a bottle of Cakebread Chardonnay. I might have gotten a bit tipsy. ;) Thanks Teresa for dinner it was a lovely night! Our salad was fresh and tasty. I can't recall now if this was Carmine's salad or the mixed salad. Below is the Porterhouse steak with peppers and onions. This was delicious, cooked perfectly! The group wanted to order Fettucini Alfredo but it's not on their menu which was a shocker. Instead we got the pasta of the day which was a pesto and was good. Eggplant Parm was also good. I liked the chicken scallopini too, but the Porterhouse was the entree I enjoyed the most. After dinner we all went our separate ways. 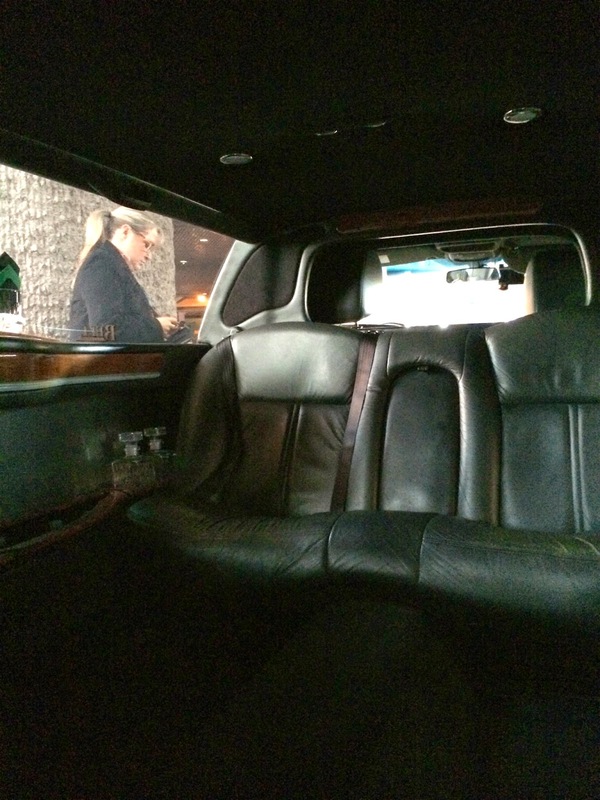 Terri gave me a ride back to Mandalay Bay and traffic was terrible. Then when we arrived at valet at MB they told us they couldn't take Terri's car because they were full even though I was a guest of the hotel! Unbelievable! I guess there was another place we could have driven to for parking but after the traffic on the strip and now this Terri opted to just go home and dropped me off. I continued to have some nice wins at the MB casino. They had the version of Fireball Afterburner that I like so I had a couple good wins on it. This was my first time playing this version of Quick Hit, had some fun with it but prefer my usual $1 Quick Hit over it. I'm not sure why I continue to try Sun and Moon at MB as the win amount below reflects hitting the bonus for 50 spins. My timing was off when the bonus hit too as I took my bet from $4 down to $2. After Sun and Moon I went back to the suite and got some sleep as I had invited friends to join me for brunch at Veranda at Four Seasons. Here's our selections this morning from the brunch buffet. Everything was freshly made and delicious! At the brunch they have a gentleman making fresh beignets! After brunch Gwen, Teresa and Jen headed back to Mirage to join Brian at the Oasis pool where Gwen had rented chairs for them for the day. I passed as 110 degree weather is not something I enjoy. This was my last day of the trip and I was feeling so tired. I went back to my suite to try to rest up as I had plans to meet some friends back at Palazzo for drinks later but there was noise from the housekeepers cleaning nearby rooms so I gave up on getting any sleep. Back to the casino for some more slot play but while I had some nice wins I was sort of out of it at this point due to lack of sleep. 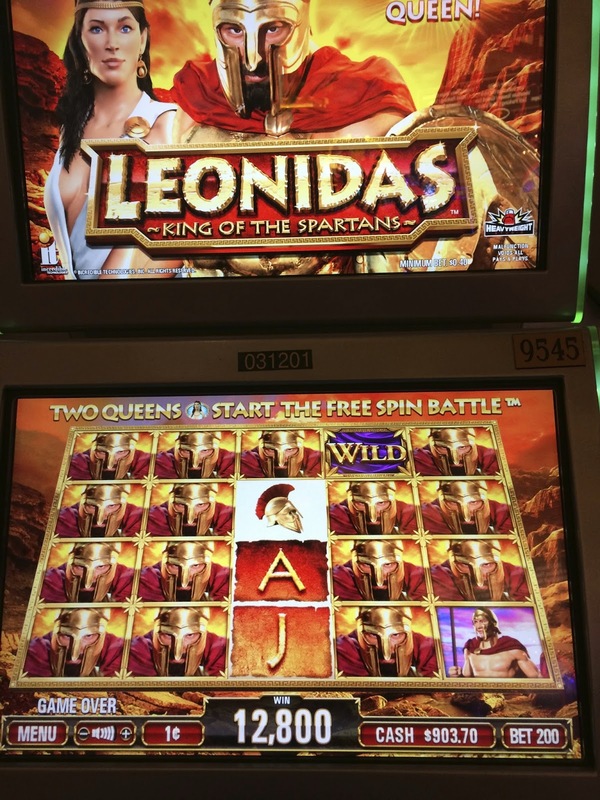 $1 Cleopatra gave me a hit and bonus at MB, but no big wins. I tried The Walking Dead slot for the first time in May briefly at MGM Grand and got lucky and hit a great bonus win. I was also lucky on it at MB and hit the bonus a number of times for good wins. 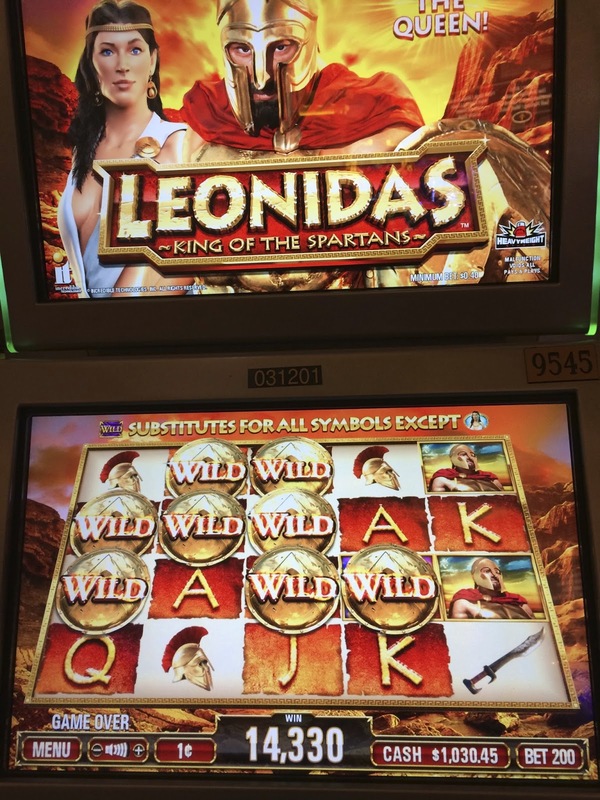 Today I stumbled upon 50 Lions at MB, an older but beloved slot and it was very active for me. I was so tired today that I didn't do any live tweets or Facebook posts, it just seemed like too much effort. I also sadly canceled out plans with the group I was meeting at Palazzo for drinks, I was just too tired. I was leaving on the first flight out the next morning and would have to get up around 4:30am so I decided to make a early night of it and catch up with them on a future trip. Tonight I would be eating at the Bellagio buffet. I had a Myvegas award for this but after reading it I realized it wasn't good on weekends, LOL! Didn't matter since Gwen had comps and ended up treating us to the buffet, but still it pays to read the fine print! I did my usually combination tram/walk to Bellagio and on the way through Luxor this time I stumbled on Hershey's Chocolate World! Chocolate lovers this is worth the visit! The pastries in the cases all looked marvelous. If I wasn't walking over to a buffet I would have bought one. After leaving Luxor and walking the rest of the way to Bellagio I checked out the Bellagio Conservatory on my way to the buffet. 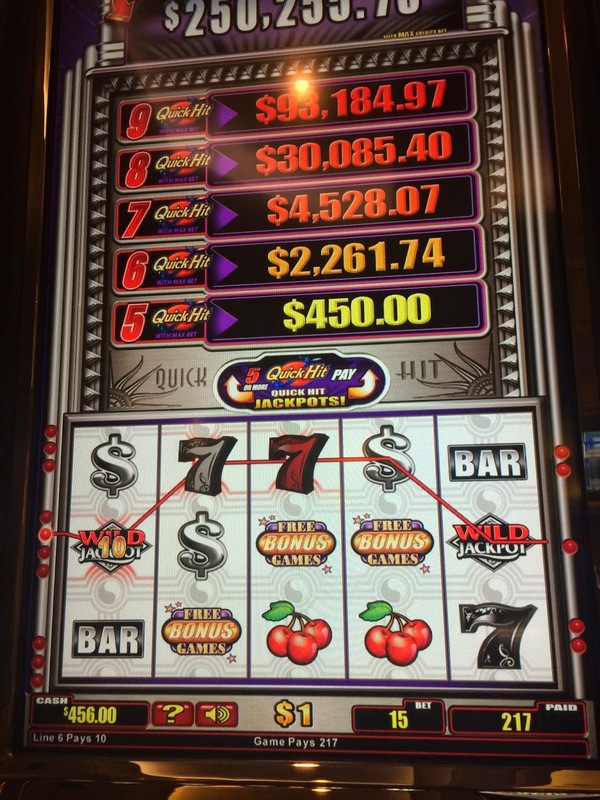 I was a few minutes early for meeting up with my friends so I gave the one $5 Pinball slot that Bellagio has a try and hit a bonus which was nice. I couldn't go to Bellagio without again playing Clue! Our group at the buffet was Gwen, myself, Jen, Teresa, Jonathan and Michael. Once again I failed at getting a photo of us together. The weekend Bellagio Buffet was very good. 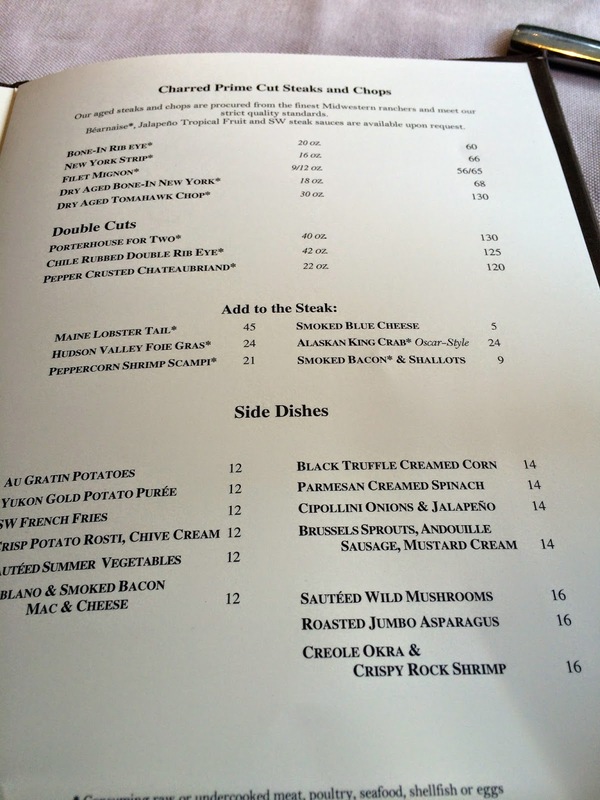 The selection was much better then last time I ate here on a weekday, however the price is more on the weekend too. After our early dinner we all hung out at the Bellagio casino for about a hour. 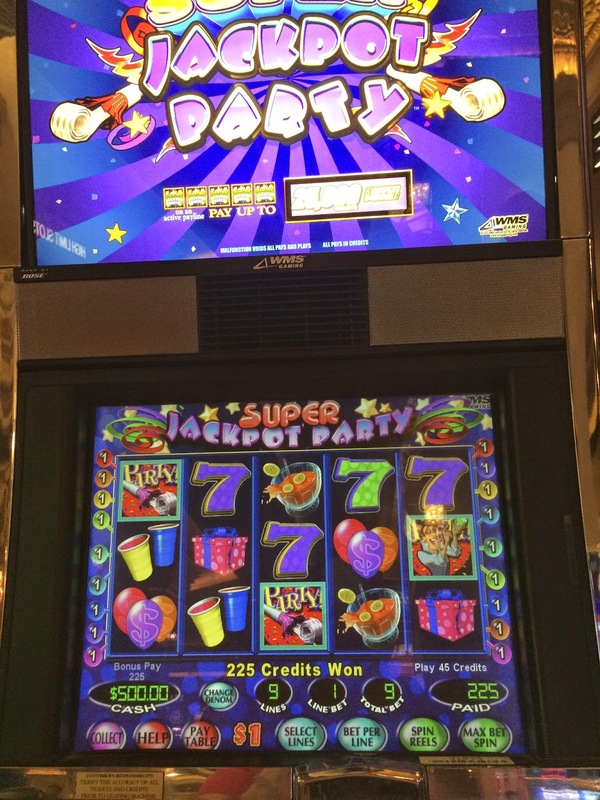 Teresa sat down at this showdog themed slot and said she had never hit the bonus playing it. I sat next to her and quickly hit the bonus and won a nice amount too. After my bonus Teresa hit her first bonus on this slot but her win sadly wasn't as nice. Bellagio has OMG! Kittens so I had to give it a try again after my previous nice win I had at Encore on it. This win wasn't as good but I got it on my first spin, so I was happy! After leaving my friends I grabbed a taxi back to Mandalay Bay where 50 Lions was still active and giving me a few nice wins! 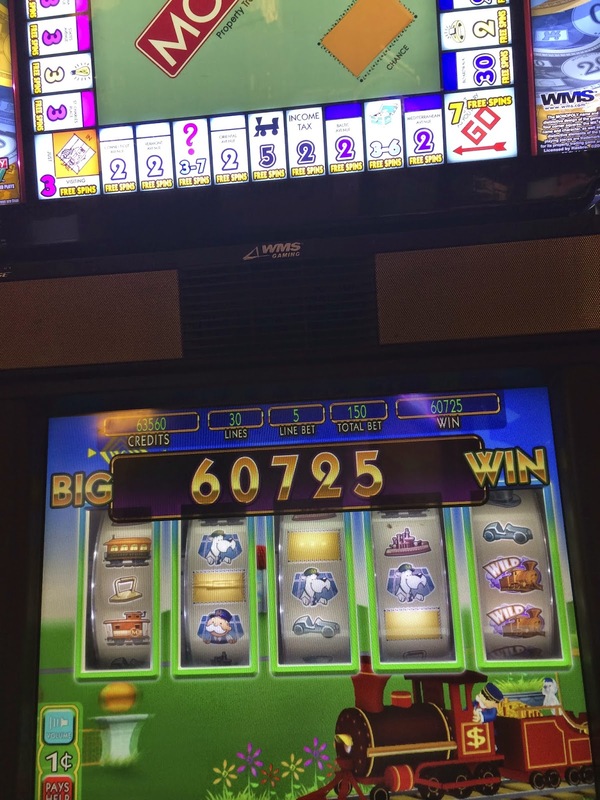 I spent the next 90 minutes revisiting my favorite slots and had some decent wins on them. I was really dragging when I returned to my suite to pack up and get some sleep. It was only 9:30 but felt so much later. After about 5 hours sleep it was time to leave for the airport. This early in the morning check in was a breeze though I did have to wait 5 minutes for Southwest to open up their counters for checking baggage. Perhaps I didn't have to get there quite so early for a morning flight, LOL! Flight was uneventful and my son remembered to pick me up at the airport which is always a win. :) I had lots of wins this trip and was able to record some fun slot bonuses, but I didn't go home a winner, it was a break even trip for me. My next trip after this one which was my July birthday trip with my Mom and husband has already happened! 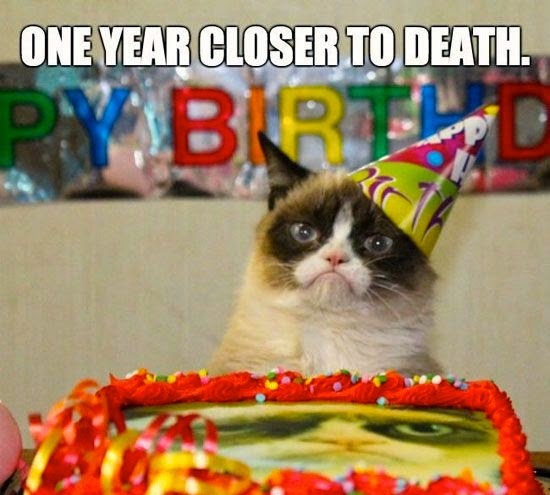 I'll be posting that soon and a couple weeks before the next birthday trip which is the end of August. Cheers! As ever,another wonderful TR!!!! Thank you so very much Diana!!! Hope you are well!! Chriss in UK. I felt for sure you were going home a winner after all those good bonuses....ahh well, break even is as good in my book. I love all your food pictures but it sure makes me hungry and wish I was back in Vegas! 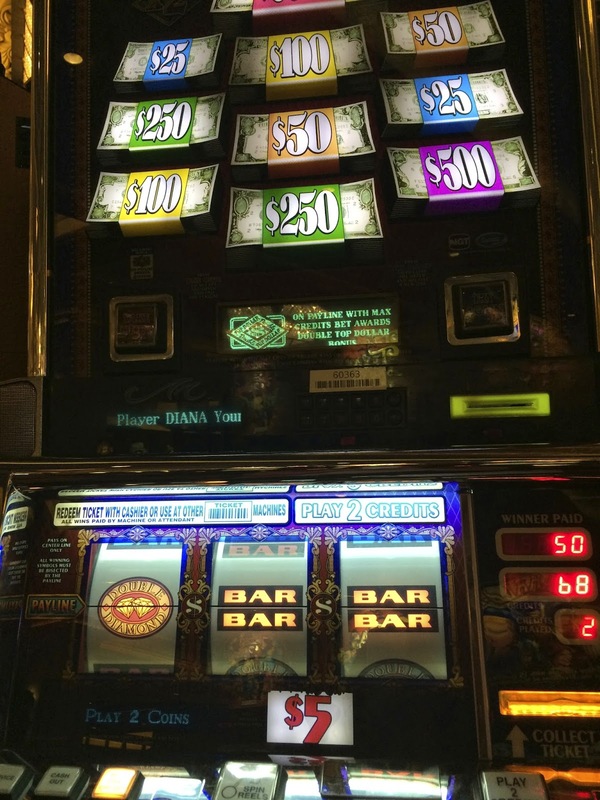 Mark, I also thought a few times on the trip that I might be going home a winner, but darn those slots, LOL! Hi to Andrea too and I wish you both could return to Vegas soon, but at least we should be able to get together next year. Thank you for an excellent trip report! 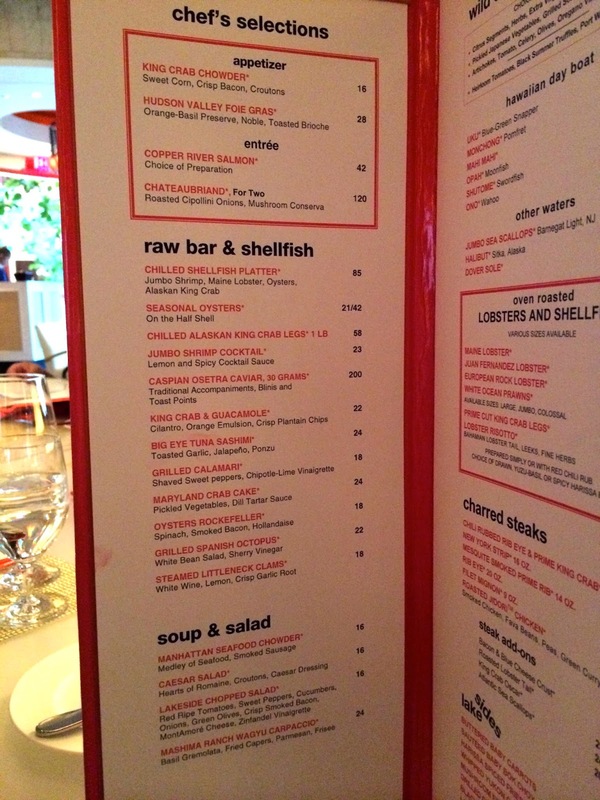 I have never commented here before, but I read your blog regularly and have learned so much from your experiences (Cut is now our FAVORITE restaurant on the strip next to Tao, where I always get the sea bass). Speaking of Cut, how would you compare it to SW? I think I want to try SW next if I can rip myself away from Cut! Thank you again -- maybe our paths will cross in Vegas some day (my partner and I are lots of fun!). 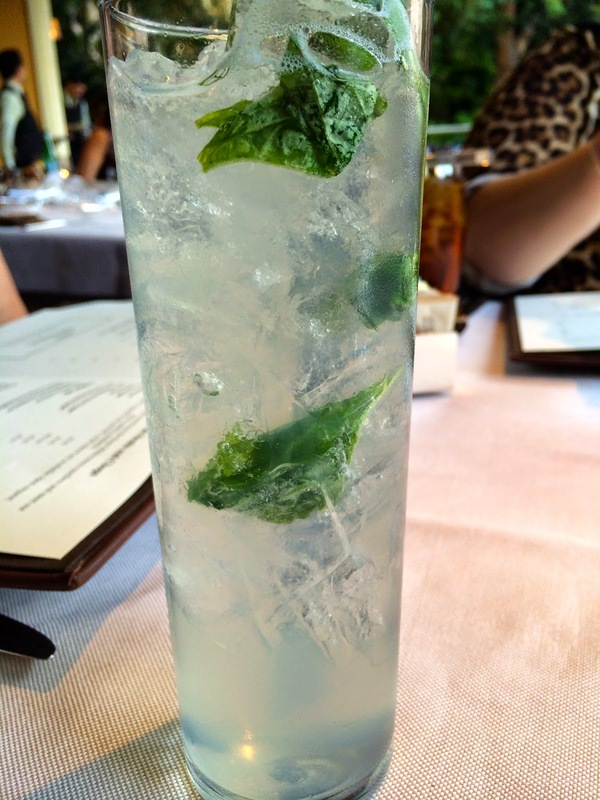 SW has great food and a wonderful ambiance if you are seated on the patio or near it. Deeper into the restaurant it can be noisy and not relaxing like Cut. Service at SW the last few times I've been there has been wonderful, however there have been previous visits for both myself and my friend Terri where it wasn't, so it's not as consistent as Cut is for excellent service. Having said that, I believe you and your partner would like it and it's always great to branch out and try somewhere else. Try to book far enough in advance though or not on a weekend evening and request a patio table. Even if you have to wait for one it's worth it. I always enjoy meeting fun people in Vegas so next time you have a trip planned just let me know the dates and I'll let you know if we're both going to be in Vegas during the same time. 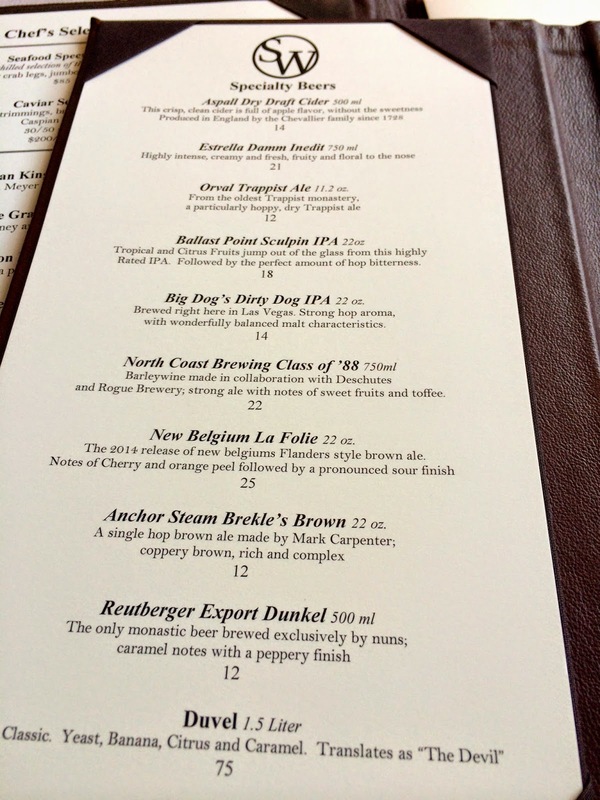 I ate at DB Brasserie last month during my birthday with my Mom. I have some photos of the food on my twitter account. I really liked the butter poached Halibut there. The Grand Mariner soufflé was wonderful for dessert as was the chocolate dessert we ordered which now I don't recall the name of off the top of my head. Their bread basket was the only thing I didn't like at the time. We had good service there but we did eat early due to Mom. Have a fun trip and I hope you win lots! Hey Diana..looks like you had some awesome meals this trip!! I always wanted to try Verandah for brunch(along with E at Jaleo and Tao).Quik Hits was pretty good to you this trip also!! Definitely try the Davinci in the HL room at Monte Carlo next time and let me know what you think since they took out ur fave at Venetian.THANKS for another awesome TR. I recently found your blog and I love it. So glad I found it. Your trip reports are so detailed and I love your pictures, especially the food!! I am going to Vegas for the first time in February for my 40th birthday!! I am beyond excited about my trip. I can't wait to try some of the places that you write about. Thanks Stephanie, I'm glad you discovered my blog and it's helpful. :) Vegas is a great place to celebrate your birthday. Perhaps I'll end up in Vegas during the time you are celebrating your birthday there in Feb! I dont usually comment on blogs etc., but just wanted to drop a note to say how much i enjoy reading your posts. I love going to vegas and try and get over there twice a year from the UK, your posts are extremely helpful and insightful. Hi PJ, thanks for letting me know that you find my blog posts helpful as that always great to hear. Perhaps we'll meet up sometime on one of your trips. Take care! Diana - thanks for another great report. The food pics are wonderful! Thanks for the additional info on Verandah (still on our to-do list) and for the update on Bellagio's Buffet. We had pretty much given up on that buffet, but perhaps will give it another try. Can't wait to try the Jurassic Park slot! It looks like a lot of fun. Cheers! Cheri, good to hear from you! If you give the Bellagio buffet another try make sure it's on the weekend, it's their gourmet (as they call it) buffet that is good. 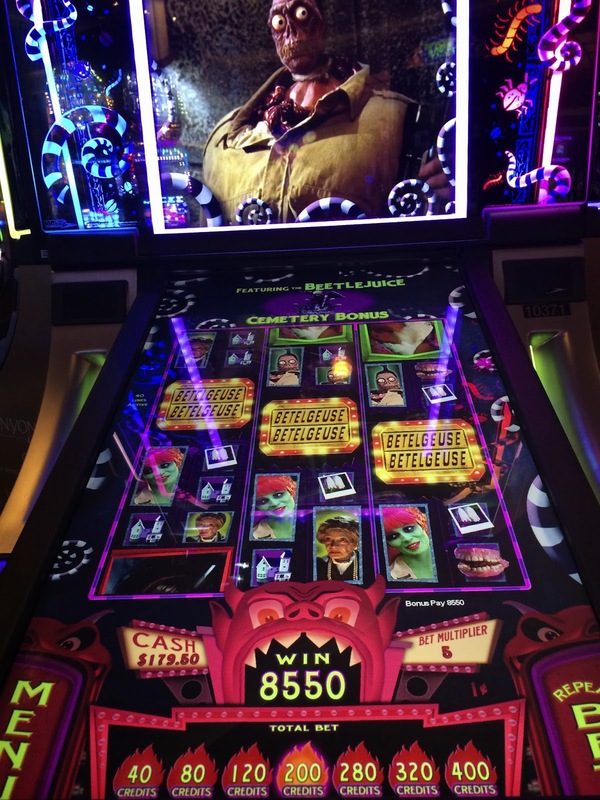 Jurassic Park typically has low pay outs but it is fun to play with a friend especially for those who are fans of the movies. Thank you for sharing all your trip stories! I have been following your trip reports for the last 4-5 months as my husband and I are leaving for Vegas on Wednesday (13th)! It has been many years since we have been there and we are going for our 10th wedding anniversary. So it has been great to hear all about different restaurants, slots, etc that you have enjoyed!!! Thanks for sharing! Hi Katie, thanks for letting me know you enjoyed my blog and that it was helpful. Happy 10th Anniversary to you and your husband. I'm sure you both will have a fabulous time on your trip to Las Vegas! I couldn't just enjoy your tremendous work without letting you know how much I appreciated it. Of course I have an upcoming trip to LV so I wanted to read stories about the BIG WINS - but you give so much more, Your restaurant reviews are incredible, as are your hotel reviews. The one factor that is so helpful to me though is - your honesty about your losses. Sure it's nice to know about the big scores and what is possible. But let's face it - the reality is, that there ARE a lot of losses that go along with the big wins. Thank you for being honest and sharing the tough part that goes along with the big wins. You have a great deal of integrity. Have a wonderful vacation in Las Vegas! Hi Michael, thanks for all the nice comments and good luck on your trip next week! BTW, it's restaurant week in Vegas starting August 22 to the 28th. Check out the menus at the URL below some great deals and the restaurants then donate a few dollars to charity. If you see me in Vegas next week would love to say hi. I'll be at the grand opening of SLS on the 23rd at midnight, and around Mandalay Bay, Palazzo and Wynn during the trip. I always wear a head band if you are in doubt it's me and my dates are the 22-28, same as restaurant week, a happy coincidence, LOL!